Thanks for posting this. There are a couple of Wildlife comments on the Off-topic section. I didn't know where else to post it. It's an important issue IMO, though not many agree. BTW, there has been a lot of coverage in the last couple of days of the carcase of an emaciated polar bear, but the widespread attribution to climate change seems tenuous. We have destroyed this ecosystem. There is no other way to put it. The Arctic canary has been dead for some time. It's changing quite rapidly, and the weather is weirding on my side of things. I'm heading for the north coast of the Kola peninsula in 2 weeks. There's been almost no rain for the last 2-3 months. The rivers are 50-60 cm below average. I was hoping for some cloudberries in addition to the odd trout, but I can't see that happening. Temperatures have been up to 34 C as far as I know. I've fished and travelled the north coast of Kola for nearly a decade and norwegian Lapland for twice as long. The insect hatches are coming earlier and earlier, and spring is early. The most striking and easily visible change is the vegetation. The tundra on the norwegian side is "slowly" turning into forest. Trout are displacing arctic charr in a couple of rivers i know of. The fish-scientists I talk to blame a combination of temperature and possibly pressure from sea-lice from the fish farms. The displacement is happening in rivers where none of the fish go to sea as well, so I'll put my money on temperature. I'll give a brief report about the state of things on the ground up there when I get back. "I'll give a brief report about the state of things on the ground up there when I get back." Thanks for the insights. I look forward to any further observations you may have. An interesting BBC article about an expedition to record wildlife around the Laptev Sea and the possible impact of increased shipping and mining. They may not look very appetizing, but they are what sustains much of the marine life in the southern ocean. Antarctic krill, usually less than 2.36 inches long, are the primary food source for many species of whale, seal, penguin and fish. But there’s a problem: the waters round Antarctica are warming, and it looks as if they will probably continue to do so. If they do, a team of UK researchers says, the area where the krill grow could shrink by a fifth. It is the fact that krill are known to be sensitive to sea temperature, especially in the areas where they grow as adults, that prompted the scientists to try to understand how they might respond to the effects of further climate change. Greenland will become greener, but only slowly unless humans help to spread the vegetation. Unfortunately, winter 2016/17 hasn't been doing any favours for those members of the Ursus maritimus species stuck on Svalbard since early in last year's melt season. It will be "interesting" to see the next update on their status. Sea ice changes affecting polar bear populations in Davis Strait. Polar bear scientist at the U of Alberta, who has been studying bears for 35 years, says the ice-free period off Labrador is increasing by 18 days per decade, because of ice melting earlier and forming later in the fall. This affects bear access to seals, their preferred food. As well, "One of the big findings was the reproductive rates were down. And that means that over the longer term the population is certainly not growing, and may be declining." Beaufort beavers. Beaver dams a few miles from the Beaufort have shown up for the first time in the Northern reaches of Canada. In most years, red elderberries only ripen from late August to early September, at the end of the salmon season. The two food sources don’t overlap, so the bears eat them in sequence, gorging on salmon before bingeing on berries. But, by looking at historical data, Deacy and Armstrong found that this natural timetable has changed. In Alaska, spring temperatures have increased and elderberries have been ripening earlier. In 2014, the berries ripened especially early, bringing them in sync with the spawning salmon. And it seems that whenever both items are on the menu simultaneously, the bears always choose berries. Sure do, wish I didn't. One thing that confuses people is adult bear counts vs recruitment, ie females having enough food and denning opportunities to bear enough adult replacement cubs that survive to reproductive age at weight. Off-topic here, be good to pursue in depth on a separate forum. Try looking at the primary peer-reviewed papers by field biologists (as well as field journals), forget the Koch's twitter page (Crawford), the nonsense around goose eggs, the ABC special situation, and environmental charities pitching false hope to donors. The habitat situation for both bears and walruses is hopeless, don't kid yourself. You can best find them at Pubmed among its 27,000,000 abstracts. Svalbard also tracks polar bears. The Siberian populations, the Russians may or may not be able to track them in remote locations. Back on topic, here is the what the bears and walrus are up against quantitatively in the Chukchi, Beaufort, and Barents: way too much open water for way too much of the year. We've shown open water over bathymetry (ie walrus food diving depth) many times up-forum. Snow depth is also up-forum (10 cm doesn't work out for dens, that's why they head for certain Svalbard islands). The problem is there are many varying reports out there. Some of them claim that the numbers are back up over the last half-decade. Some claim that these are down in some regions but up in others, and say that this is because of the resilience of the Polar Bear. Of course if they are cross breeding, the offspring won't be Polar Bears. Thanks for points on this A-Team. If you want to add more to the subject later, this thread ought to be ok. I will dig for more details myself as I have time. Great idea to have this topic wili. And there definitely is a lot more to observe than just the emaciated polar bears indeed. From "grolars" to reindeer, the Alaskan orca's failing to reproduce, to the life forms on the sea floor. If i see any interesting studies i will try to post, thanks mate. Maybe he is just trying to avoid the brutally cold Siberian winter lol. A bit off topic i guess, interesting theory nonetheless. Was Novaya Zemlya a safe haven during the ice age? Nice forum topic. Posts on this topic are currently scattered all over the place. I hope to contribute regularly once the freezing season calms down. A colleague sent me a pre-print on pre-extinction genomics of the Wrangel Island mammoth. That's quite relevant to polar bears and possibly walrus. There's been a lot of work on polar bear and brown bear genomics, both contemporary and fossil. The former's adaptations to life on ice are maladaptive to land. Since seeing all those Wrangel PB's feasting recently on that dead bowhead whale, I've been wondering what they possibly could be eating the rest of the season: the nearest ice is a long ways off and has been and will be for months. Here's a walrus snippet from today's Guardian. It implies that FWS has just released an extensive ESA review document. Even though the document top and bottom will be politicized rubbish, there may be good material in the interior from agency wildlife biologists. I'm curious as to where they think walruses will go to feed when a thousand km from the nearest sea ice? The loss of summer sea ice in the Chukchi Sea is putting increasing pressure on walruses, at times pushing them ashore where they have limited food options and are more vulnerable to predators. Young walruses can also be trampled to death when large numbers of the animals have to congregate on land. Last month, an estimated 64 walruses, most of them less than a year old, were found dead near Point Lay in Alaska. An even larger “haul out” of walruses at Point Lay was documented in 2015. Scientists have predicted the Arctic will be devoid of sea ice in summers by the 2030s. Data released last month showed that the minimum sea ice extent was 1.79m sq miles at the end of this year’s summer, around 610,000 sq miles below the long-term average and the eighth-lowest year in the 38-year satellite record. In 2008, the loss of sea ice was deemed sufficient reason for the FWS to list the polar bear as a threatened species. A study published last year found that a third of the world’s polar bears, which currently number about 25,000, could be lost within the next 40 years. Previously, the earliest haulout date on record was Aug. 17, back in 2011, said Fish and Wildlife Service spokeswoman Andrea Medeiros. The gathering of the enormous animals near Alaska's Chukchi Sea coastline is the result of retreating sea ice in recent years. Walruses typically use floating ice as platforms to rest between dives to forage for food, but summer and fall melt has forced them ashore. The animals haul out about two weeks after the continental sea ice recedes. "This year, sea ice has retreated beyond the continental shelf earlier than in previous years," Medeiros said. A herd of 6,000 Pacific walruses hauled out on the same barrier island last year, but at a much later-than-average date of Oct. 7. But after a weekend there, the herd appeared to have moved on, with officials reporting that the animals were likely headed south to coastal haulouts in Chukotka, Russia. Antarctic, but, hey. Press release posted on 13 October 2017. A colony of over 18,000 pairs of Adélie penguins in Terre Adélie, Antarctica, suffered a catastrophic breeding failure at the start of 2017 with only two chicks surviving. WWF is demanding greater protections of the waters off East Antarctica next week at a crucial international meeting in Hobart, Australia where proposals for a new Marine Protected Area (MPA) will be considered. A follow up on the polar bear cub found 700 km south in Siberia. Seems it is not the only one doing so and seeking out humans. Gray whales, like anything under global warming migrate further north. Gray whales, though limited to the Northern Pacific may be using the Northwest Passage to recolonize the Atlantic and have turned up in Barcelona, Israel and Namibia. On the other hand 1 of the 2 Pacific populations that exist, the western population is thought to be lost and smaller migrations to and from the one remaining eastern population are observed. So predominantly whales are moving east in the Pacific, rare Russian whales being seen in US. Whales are moving north in general and spending more time there. But in the Arctic they are more often seen to the west as well. Turning up in Siberia as far as the Laptev Sea, and other whales apparently even going right through the Arctic east, all the way down to the Atlantic and Southern Africa. I wonder if anyone here has some recent/decent info on the Arctic wolves in Greenland especially? The Greenland wolf research program website doesn't offer much and seems to be desperately looking for volunteers who are super-fit and able to spend "US$8,000-10,000 for one month in the field." I'm sure they have little help or possibilities in this understandably very difficult task. Perhaps they should start by putting an email link on their site...no contact info does not help. Arctic wolves a.k.a. the "friendly wolves" and their prey species are likely subject to changes in climate as anything else is. The hopelessly skittish or outdated info available indicates for Greenland some 50-60 wolves, which is of course considered way below a healthy breeding population. Maybe for the wolves in Greenland or Canada there are trends resulting in prey abundance by CC but also genetic diversity. Dave Mech studied the wolves on Ellesmere extensively of course and their demise is well known. I hear it is the longest lasting wolf study ever. The Greenland population only ever suffered hunting it seems from Scandinavia mostly, although foxes were a better source of income. Farley Mowat is well known for Ellesmere as well and a movie about it, but disputed it seems. Gordon Buchanan did an excellent documentary for BBC in Canada more recently named "Snow wolf family and me", which i highly recommend. For Greenland who knows...thought i'd give it a long shot. Images below also not reliable therefore, the range has to be changing. And a pic by Mech that must be from Ellesmere. For the first 28 years of Divoky’s study, chicks ate cod almost exclusively. But in 2003 parents began serving fourhorn sculpin, an ugly fish with a lumpy head and spiny fins. Divoky would find chicks choked dead with enormous sculpin lodged in their throats. Parents eventually learned to catch smaller sculpin, but chicks still suffered. “It takes a long time to break down all that cartilaginous mass” in sculpin fins, Divoky says. Just one fish is enough to fill a chick’s stomach. “It’s like, ‘I can’t get anything else down, I’ve still got the last sculpin head in my stomach.’"
The following article mentions Polar Bear populations in decline. "In some Arctic regions, scientists have documented declines in polar bear numbers and disturbing signs of physical deterioration linked to the loss of sea ice." Lead author Jeffrey A. Harvey, as quickly answered, "By contesting scientific findings about polar bears, denialists hope to instill doubt about climate science as a whole, Dr. Harvey said. “Every time these deniers make some outlandish claim in the media and we don’t respond to it, it’s like a soccer match and we’ve given them an open goal,” ". AGW deniers rely on the 1960's restrictions imposed on polar bear hunting that have bolstered polar bear numbers, to disguise the extra stress that sea ice reductions have wrought on polar bears. In these days of "don'T rump sigh-ants", AGW scientists,while preparing their Science Papers, will also have to prepare refutations to auto-reflex AGW denier drip & dribbles. ...But the most important point is that whatever happened in the past is really irrelevant. Polar bear habitat is disappearing due to global warming. Even the most careful on-the-ground management doesn't matter if polar bears don't have the required habitat. Your recent post seems to confirm my latest statement that the numbers are just estimates. Link #1: "The scientists also caution that we still don't have a firm count on these mobile, remote, supremely camouflaged beasts." "Before anybody tries to change the world to save polar bears … somebody should figure out how many polar bears there are." Link #2: "Even now, about half of our population estimates are only educated guesses." If you have any credible research showing reliable population figures, please post them. Otherwise, you are just adding to the guesswork. NYT reported just minutes ago that questioning polar bears numbers are (again) the latest vogue among denialists. Do we need any more proof that this is exactly what we have among us? Viewing videos of starving bears has been enough proof for me. LOL. I guess blind faith has become the new science within the NYT. It is a good thing that the rest of us scientists are not following suit. Hopefully, you are not. Denier daniel doles out its dilly dilly, guessing with blind faith that it can launch its "denier sigh-ants" on the web. I see. Since you cannot refute my claims scientifically, you must resort to name calling. How nice. I don't usually respond to this troll, but this is really beyond his usual trollishness. You have a stronger constitution than I do. I set him on ignore months ago. He wanders around this blog and than on random threads, he takes a dump. can someone add this dipshit to a moderation policy where he gets banned if his posts don't include falsifiable claims? thanks. I wish it saw more use. The danger is that if I would apply this rule all the time, things would get very quiet around here. Like I've said before, this forum is big enough for one skeptic/lukewarmer/climate risk denier. Call him out, by all means (I do so as well occasionally), but by resorting to name calling, you lose the argument. You have to see Daniel B. as a test dummy to practice on. As long as he doesn't post links to climate science disinformation, I'll give him some leeway. Indeed. If particular members cause you so much anguish that you feel you might go on a maniacal rampage, just do what sidd said and hide them from your view. You'll be amazed at the therapeutic benefits of doing so. Also: in almost all cases, one only needs to quote the immediately preceding comment in a particular thread. Doing otherwise leads to the confusing and space-gobbling infinity mirror effect. It doesn't matter if precise population figures exist or not. That is usually the case with any species duh....until they are nearly wiped out that is. Otherwise we can't know how well the grizzly or bobcat is doing...nonsense. this guy is a waste of space indeed. Making them the oldest creatures on Earth..wow! The bears had lost their fear of police patrols and signals used to warn them off. ... these four dead whales are just the latest in a rising tally. In 2011, a killer whale was found frozen in ice in the north of the bay. In 2013, an estimated 17 killer whales were seen swimming in the frigid water, their movements tightly constrained by the drifting pack ice. Most, if not all, of these whales are thought to have died. 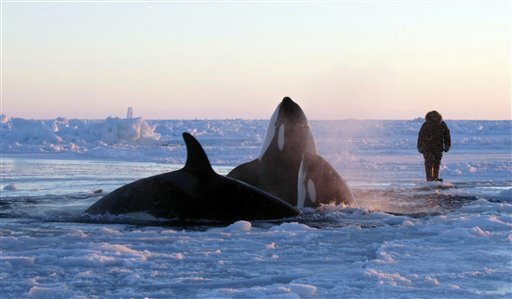 As far as scientists know, in the Arctic, more killer whales have died in the ice over the past decade than have suffered such a fate over the past century. May i suggest that in the interest of the animals in question and their general reputation among all the less interested and/or knowing (thinking) population of planet earth we use a different name for them than "Killer Wales" ? Nothing good can emerge from calling an animal "Killer" a bad habit IMO with a similar effect like the "JAWS" movie had on white sharks population and sharks in general. When we are quoting a source we are using their words. There are many implications, researchers say, and surprisingly most of them are good. Human consumption of tanner crabs—one of three species sold as snow crabs—that feed on methane-eating bacteria and archaea should not pose a health concern because methane seeps are not toxic environments. The discovery actually may mean that methane seeps could provide some seafloor-dwelling species an important hedge against climate change—because nearly all models predict less food will be falling into the deep sea in coming years. "Tanner crabs likely are not the only species to get energy from methane seeps, which really haven't been studied all that much. We used to think there were, maybe, five of them off the Pacific Northwest coast and now research is showing that there are at least 1,500 seep sites—and probably a lot more. Open Access: Sarah Seabrook et al, Flipping for Food: The Use of a Methane Seep by Tanner Crabs (Chionoecetes tanneri), Frontiers in Marine Science (2019).